Hero avatar is a short summary of your hero. Your hero's portrait is a shortcut to hero's Attributes. Together with nick of your Hero, you can also see, where hero's current home village is. From here, you have an easy overview of your hero's life, experience and you can easily access auctions and adventures, which number is displayed above it. This window can be closed / opened by clicking on the green arrow. Bellow hero's avatar, you can see your alliance status or your alliance's name. 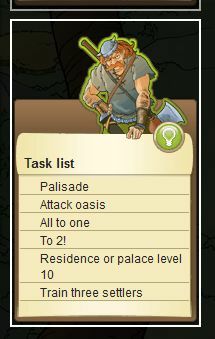 Through icons you have an easy access to (in case you are a member of an alliance) alliance Overview and Forum and to your Embassy. In this overview, you can easily access the main parts of your village – Marketplace, Barracks, Stables and Workshop, if they already exist in current village. 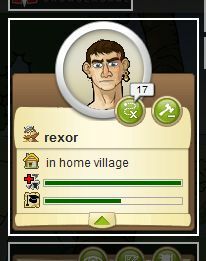 You can also see village's loyalty and, if you click on the pen, you can edit village's name in a pop-up window. 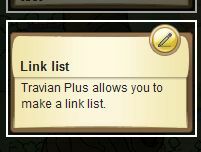 In here, you can find a list of available tasks and a small bulb, which will open Travian's UI.